I know some folks think that manufacturer recipes aren't quite as ... appealing ... as those from chefs who write cookbooks. But think about it. There are plenty of classic and beloved recipes that came from the backs of bags, boxes, and cans. It makes sense. Manufacturers create and test recipes that show off their products. They want you to make the recipes, love them, make them again and again, and buy more products. So I had high hopes for The Tabasco Cookbook . The book I received for review is an updated and revised book, but I'm not sure exactly what had changed since the original was published. 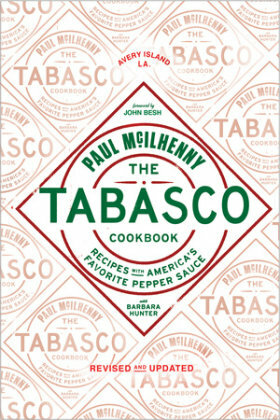 Recipes range from well-known (fried chicken, grits, guacamole, salsa, shrimp Creole) to some that are probably unique to this book (lemon-sesame asparagus, Spanish potato salad, portobello nachos, mellow cabbage salad) that feature Tabasco sauce. Some of the recipes are extremely simple, like adding a bit of Tabasco before grilling a steak, or adding Tabasco (two different kinds) to guacamole rather than adding hot peppers. Other recipes are more complicated. Which is nice - something for everyone. Most of the recipes have a southern vibe, and specifically a Louisiana twist, which makes sense. There are tips on a lot of the recipes, some of which are mini-recipes, like a crudite dip with 1 cup of mayonnaise, 1 tablespoon of ketchup, and one teaspoon of tabasco sauce. Overall, it's a nice little book. Certainly not essential, but a nice addition to the cookbook shelf of someone who likes spicy food. It would make a nice gift item wrapped up with a couple of bottles of different styles of Tabasco sauce. I received this book from the publisher, for the purpose of a review.